We recommend checking out our discussion threads on the Shinybow 8x8 VGA and Stereo Analog Audio Matrix SB-8188LCM, which address similar problems with connecting and setting up Routers & Switchers Shinybow. The user manual for the Shinybow 8x8 VGA and Stereo Analog Audio Matrix SB-8188LCM provides necessary instructions for the proper use of the product Professional Video - Signal Processing & Distribution - Routers & Switchers. 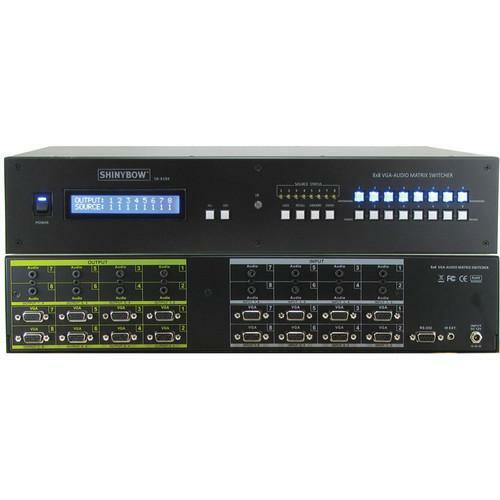 The Shinybow 8x8 VGA and Stereo Analog Audio Matrix Routing Switcher features eight individual VGA (RGBHV) video inputs with eight 3.5mm stereo audio inputs, and eight individual VGA(RGBHV) video outputs with eight 3.5mm stereo audio outputs. Because it is a matrix router, any input may be routed to any output, or the same input may be routed to all outputs, or any combination thereof. This is useful for switching and sending signals from VGA source devices, such as personal computers, set top boxes, and satellite receivers, to VGA destination devices such as monitors, HDTVs, and projectors. Control is provided via front push-buttons, IR remote control, or RS-232. A two-line LCD display gives real-time status information, such as signal routing. The RS-232 interface lets you control the switcher using the GUI interface or with a third party controller. Windows-based control software is included to provide complete remote control of the switcher from a PC. Also included is an IR remote, IR extender receiver, RS-232 cable, CD-ROM with RS-232 driver, 12 VDC power supply, and rack mounts. If you own a Shinybow routers & switchers and have a user manual in electronic form, you can upload it to this website using the link on the right side of the screen. Box Dimensions (LxWxH) 20.7 x 12.2 x 6.5"
The user manual for the Shinybow 8x8 VGA and Stereo Analog Audio Matrix SB-8188LCM can be downloaded in .pdf format if it did not come with your new routers & switchers, although the seller is required to supply one. It is also quite common that customers throw out the user manual with the box, or put the CD away somewhere and then can’t find it. That’s why we and other Shinybow users keep a unique electronic library for Shinybow routers & switcherss, where you can use our link to download the user manual for the Shinybow 8x8 VGA and Stereo Analog Audio Matrix SB-8188LCM. The user manual lists all of the functions of the Shinybow 8x8 VGA and Stereo Analog Audio Matrix SB-8188LCM, all the basic and advanced features and tells you how to use the routers & switchers. The manual also provides troubleshooting for common problems. Even greater detail is provided by the service manual, which is not typically shipped with the product, but which can often be downloaded from Shinybow service. If you want to help expand our database, you can upload a link to this website to download a user manual or service manual, ideally in .pdf format. These pages are created by you – users of the Shinybow 8x8 VGA and Stereo Analog Audio Matrix SB-8188LCM. User manuals are also available on the Shinybow website under Professional Video - Signal Processing & Distribution - Routers & Switchers.